I've been told that you can use VHO fluorescents on tanks up to about 24" deep, but more than that you need metal halides. Does it go the other way, too? I mean, if you have a tank that is only 12" tall, can you use regular full-spectrum fluorescents and still have a successful reef? To a large degree yes; though an answer to this sort of query must delve into a few statements of fact, definitions and qualifiers to be of real use. First, let's agree that the intensity of light (number or quanta of photons) is the principal difference between full-spectrum fluorescents (FSF) and metal halide (MH) lighting sources. That is, both types produce adequate amounts of light in necessary and desirable (function and aesthetic) wavelengths to support and showcase captive reef life. MH is more intense, and thus able to penetrate to greater depths and provides more light to shallow ones. Whether this is critical or something you want though depends on two further major considerations: the type of life you intend to keep, and how much you want to "push" it. In aquariums as in the wild, there is a broad range of benefit and tolerance to more light. For example, Corallimorpharians (coral anemones), most of the photosynthetic gorgonians and soft corals (Order Alcyonacea) available to hobbyists get along quite well on FSF and compact fluorescents (CF) in the deepest of hobby aquariums. On the other hand, several of the popular true or stony corals (Order Scleractinia), do poorly unless provided either a roost in a shallower setting (with FSF, CF), or MH in greater depths. The "pushing" issue is a consideration of how much you want to enhance your organisms metabolic rates. Lighting, along with nutrient availability, conscientious filtration, and current are principal inputs to this physiological "driving". Do you want your Acropora for instance to grow about as fast as possible? Maybe it will become more spindly, less colorful, more short-lived as a consequence... Perhaps the cost of water testing, dosing and amelioration is only "worth it" up to a point. Each aquarist must ask themselves this question; "Per the species/specimen and environmental settings, what do I want my livestock to do?" Obviously all light-affected life needs to be accommodated within its environmental tolerance; hence you must study and provide at least the minimum or at most the maximum amounts of light per that species/specimen in your setting. Such information is invaluable, and often more than just a matter of reading and chatting with other reef hobbyists and dealers. A tried and true approach for new introductions is initially placing them further down or away from the most intense light area, and moving them "toward the light" as they display a propensity for it. One last element of this "how much light will do/is too much" question I'd feel remiss to leave out is the effects of dissolved (mainly colored) material in the systems water. The cleanest of seawater absorbs, reflects and diffracts light; more and more with depth. The presence of suspended solids and various chemicals has an additional, often pronounced effect on diminishing photo strength. In practical terms, and for more than light penetration reasons, you want to keep concentrations of this matter to a minimum; principally through skimming, water changes and possibly the use of chemical filtrants. This is an area of discussion that merits much more emphasis and investigation. Lighting, fixt. I currently have a Coralife SHO 48 inch strip and two 55 watt 6700 k I would like to keep clams, corals and invertebrates i.e. anemones. Is this sufficient. Do I need to add a blue actinic, the SHO light strips are expensive can I get away with adding a single or double fluorescent fixture for the actinic. 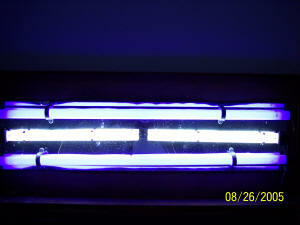 I was looking at a RedSea Phazer IV, with two AquaStar 10k's and two Coralstar Actinic Blues what are your thoughts. Confused Regards, Lou >> I take it these are on a four foot or so long tank? Depending on depth (as long as it's not over 22", like a show model 55 gal...) the present lighting should be fine, and better with adding the actinics... even if they're normal output fluorescents. The newer lighting system proposed is nicer, but not necessary... for most collections of livestock I would have... unless you intend to push their metabolisms... and have the money, expertise to contend with the induced mal side-effects of doing so. Bob Fenner... who would just add the actinics. Hello: I've heard you talk about reverse photoperiod in regards to lighting . Could you please explain this briefly ? Thanks, Jill >> Reverse photoperiod refers to lighting regimens alternating between a main and sub-system like a sump/refugium... One being on while the other is off... the benefits of such an arrangement include a stabilization of water quality, dissolved oxygen, algae reduction... Bob Fenner, who must always remind himself of the enormous amount of cryptic and arcane terminology and verbiage in our interest, and thanks you. Lighting Upgrade Dear Bob, My present tank is 60"L x 24" W x 30" H housing only softies due to angels and BF's lit by 6 x 40W NO fluorescents. <Okay> I have two options of light upgrade, 2 x 150W MH or 8 x 55W PC. Taking into consideration that I do not plan to have SPS, which would be a better option. <A tough one here... both could be made to work. I will opt for the metal halides here though... due to the size, shape of tank, my personal "looks" preferences. Will be spectacular. Bob Fenner> Regards.